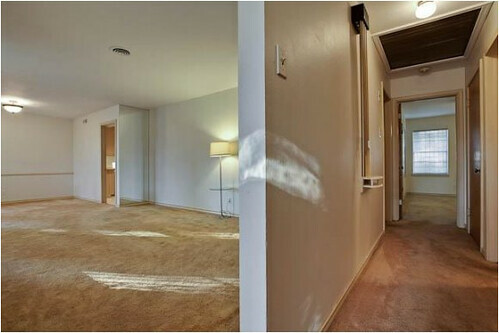 We sold our last flip in early November (you can check out all of our past flips here) and we’ve been scouring the MLS and touring zillions of properties ever since then. We even put a house on a creek lot under contract in December, but backed out just before Christmas when it became clear that our plans for adding a second story wouldn’t work – instead we’d have to tear down the house and start from scratch. Um, no thank you! 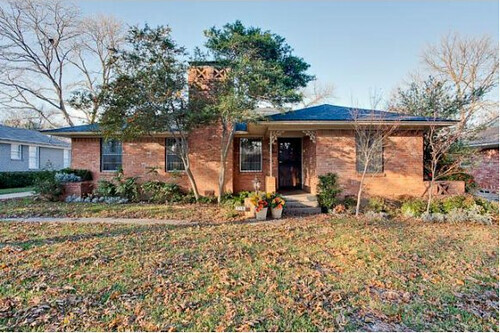 But now I think we’ve found “the one.” The house is teeny tiny (or at least compared to the homes that we’ve flipped in the past) at just 1,420 square feet, 2 bedrooms and 1.5 baths. And it’s so cute!!! 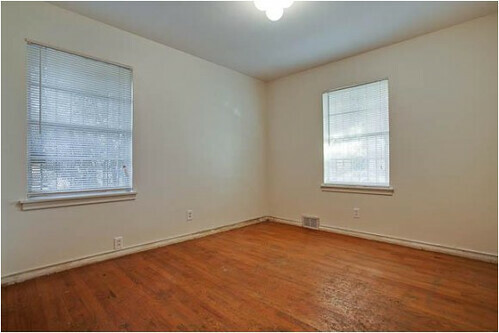 There are hardwood floors throughout most of the house (score!) 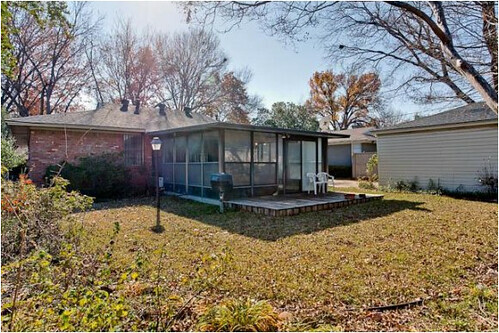 and the home is being sold by the original owner who lived there for 57 years and took really great care of the home. We’ve already had the house inspected and it looks like everything is full-steam ahead – barring any unexpected problems, we should be closing in about a week and a half! Want a sneak peek of our upcoming project? 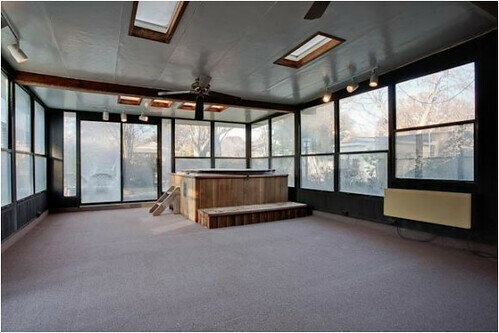 Here are some photos I snagged from the MLS listing – it’s your typical little 50’s ranch, which is right up our alley. This is your view when you walk in the front door – a hallway to the bedrooms and bathrooms straight ahead, and the formal living room and dining room to the left. Check out the fireplace! 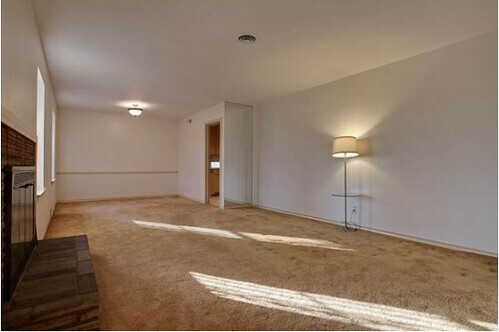 And there are hardwoods under all that carpet. There is a doorway that leads from the dining room to the kitchen, which runs along the side of the house to the backyard. New-ish cabinets!! This is a first for us, for sure. 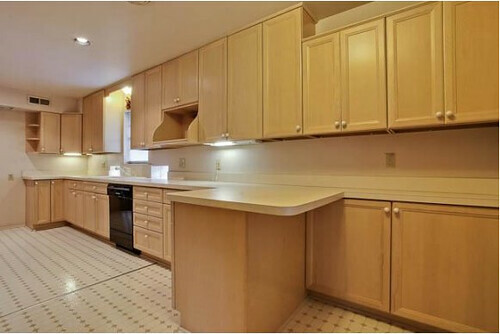 The cabinetry along the left-hand wall is Kraftmaid and is in great shape. Here’s the view looking back towards the dining room. Heading from the kitchen towards the middle of the house is the family room – for reference, it’s directly behind the formal living room. Now we’re heading out to the hallway, back towards the front door to scope out the second bedroom. 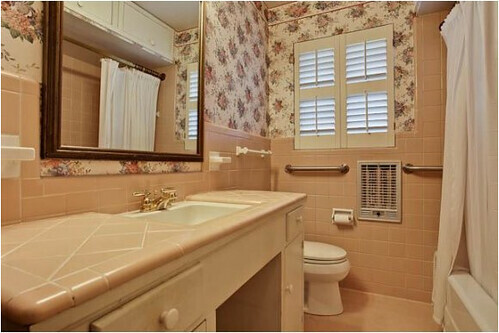 In the hallway between the two bedrooms is the full bath in all of it’s original 50s glory. 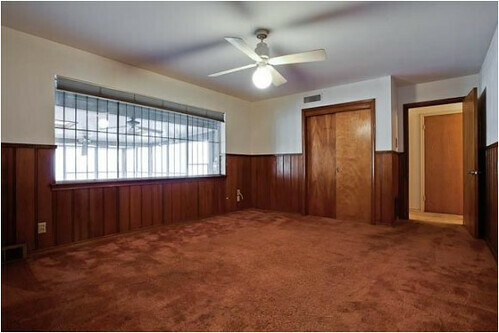 And at the end of the hallway at the back of the house is the master bedroom. 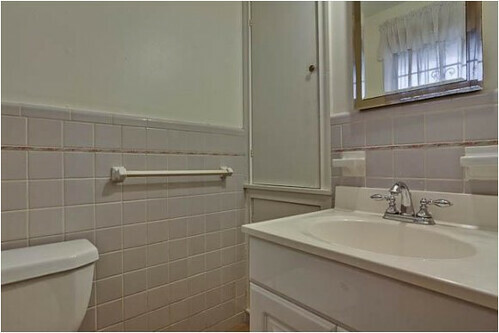 It has a tiny attached half bath. And now to the addition. Ah, the addition. Don’t get too attached to it. This sucker ain’t staying. It is a really poorly constructed addition that was added in the late 80s, and the roof is in terrible shape, skylights are leaking, it’s not insulated, all the windows have lost their seals, the heater doesn’t work . . . you get the idea. So it’s coming off. 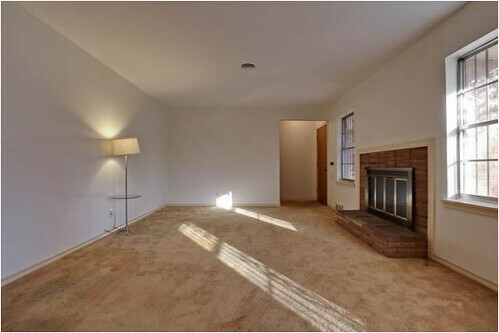 Luckily we aren’t paying for this square footage (it wasn’t permitted and isn’t factored into the price per square foot we’re paying for the house) and after we take it off we’ll still have 1,420 square feet. But, we do have to pay to take it off which is a bit of a bummer. 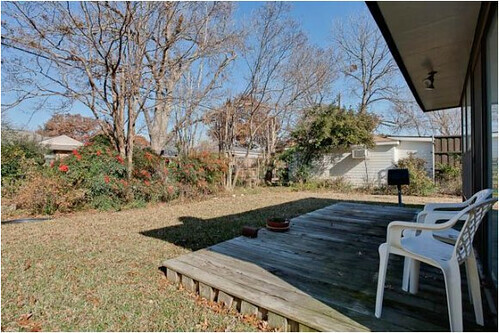 The backyard is a really decent size, I think, especially after the addition comes off. And there you have it! I can’t wait to fill you in on our plans for the house, and to chat with you about it as demolition and construction get under way. And we shouldn’t have any problems knocking this sucker out before the baby arrives in early May, so I think that’s a great bonus for tackling a project on this smaller scale. Girl, you don’t slow down, do you? It’s going to be awesome. 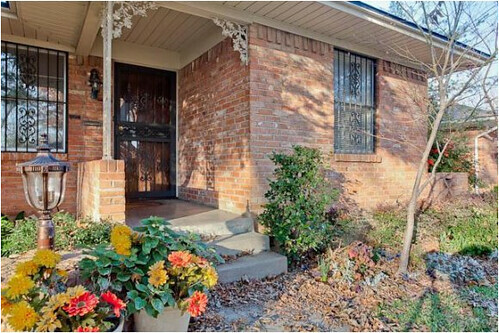 I particularly love the curb appeal from the front! Can’t wait to see you plans. It’s going to be amazing. cute! 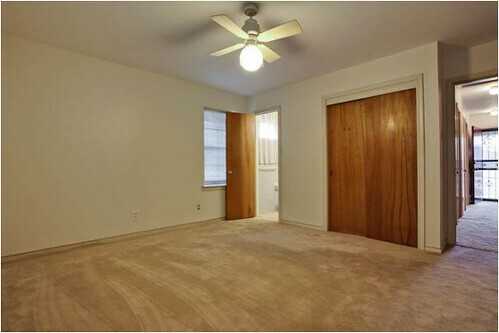 Will you be adding a third bedroom, or converting a spare room? Or do 2 bedroom homes sell well in your area? Yay!!! 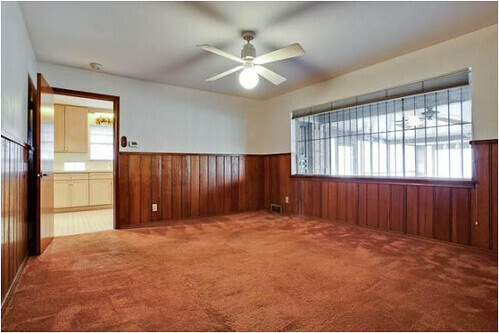 So excited to watch your progress on your newest flip. 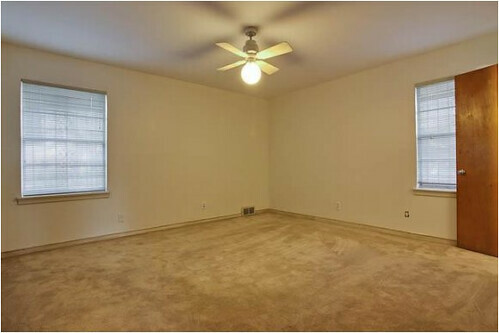 Can’t wait to see what you plan for the right side of that kitchen. How exciting! I love following you on these! So exciting! Can’t wait to see what you do!!! Can’t wait to follow along and see all your changes. Currently about to renovate an old Victorian and due in August. I’ll be lucky if it’s finished by then. Wish we were able to finish ours before May too! 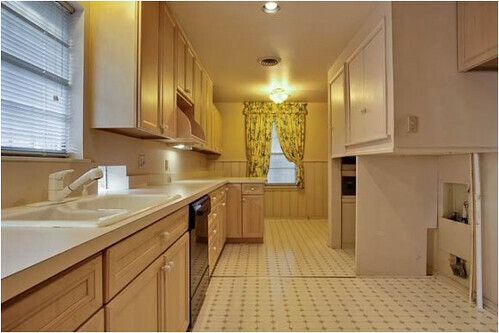 Are you going to work with the existing kitchen cabinets, then? Can’t wait to see what you do with it. But it looks like it has great bones! Sounds like fun! First time finding your site and your first three flips are amazing – especially the pics of the third. Totally great! Can’t wait to see what you do with this one! This house looks super cute! The outside is really charming, too! Bummer about the addition, we ran into the same thing with our kitchen (http://hammeringourwayhome.com/post/15993736003). 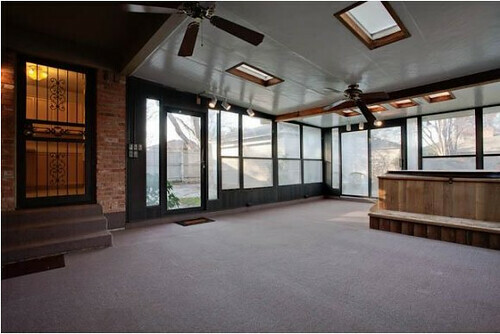 We’re planning to redo the roof and make it into a verandah- something about a patio with a roof just seems so appealing. Something to consider… Good luck if you go through with it! Good luck to you – it seems all very exciting!